African Servals are medium sized cat weighing 35 lbs approx. and with golden coats having bold black rosettes. They have beautiful long ears and lean legs. Servals are categorized as an animal whose population is lesser, compared to other cats hence the name ‘lesser cat’. 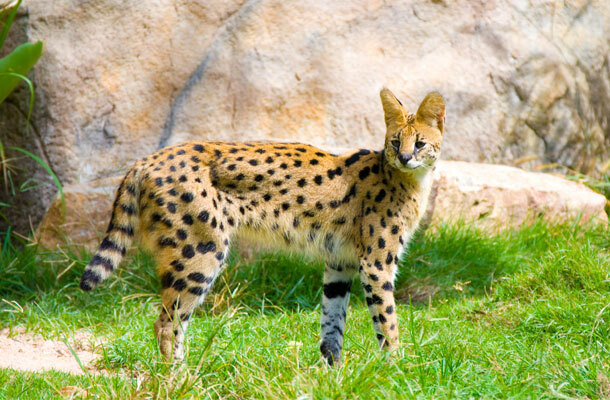 It’s highly recommended that Servals must not be mixed along with bigger cats; even though they have appearance that is similar to Cheetah, they’re distinctively different from that species. You can differentiate between cheetahs and Servals from their ears. Cheetahs have round ears which are closer to their head, whereas African Servals have pointed long ears, which can even easily detect ultrasonic sounds. This amazing sense allows Servals to hunt for their prey. 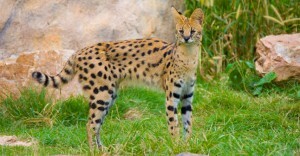 Serval means “Deer-Like-Wolf” in Portuguese. They are not someone who is known to harm livestock. Distribution: African Servals are largely found in southern part of Africa, precisely in Zimbabwe and in the province of Natal. They majorly prefer to be around water, perhaps that’s why this breed can’t be found in deserted areas. Habitat: It lives in reed beds and grasslands. They also spend time in forest brush, bamboo thickets, marshes, and streams within their home range. These wild cats are spread right across Africa and can be found in tall grasslands, savannahs, woods, brushes, forests and marsh. Diet: Rats, shrews and birds, Insects, frogs, lizards, and occasionally carrions which is dead meat. Rodents and small sized birds are one of the most preferable diets of Servals. They are quite adventurous and do not mind entering water to hunt for ducks, fishes, frogs and other reptiles are also consumed by African Servals. 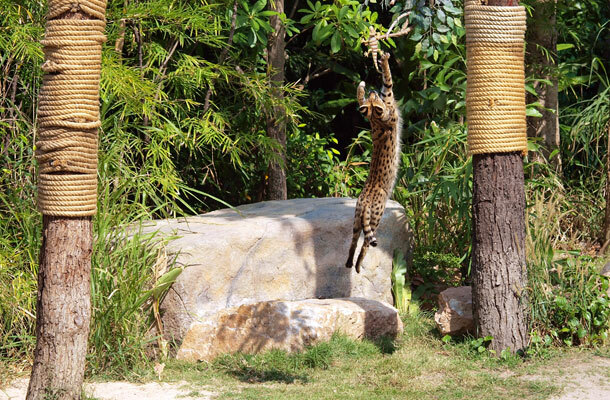 Khao Kheow Open Zoo has one of the most attractive species of African Servals in Bangkok. It has wide range of African Servals that are exhibited in Journey to the Jungle. Place showcases varietiesm where animal lovers gets an opportunity to see animals in their natural behavior. Overall it’s a wonderful place to hang out and to have fun time with family.